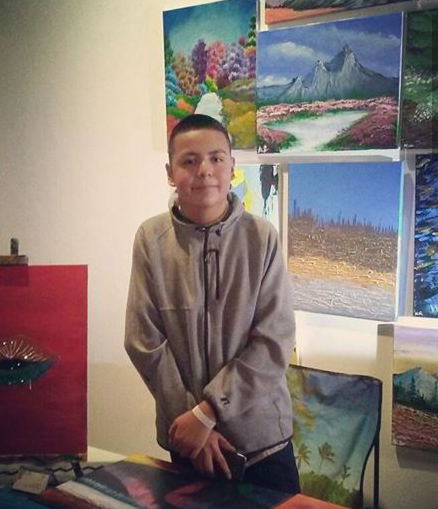 With just over one year of experience in canvas painting, 13-year-old Nathaniel Matthew Garza is making an impact among the Autism Community and San Antonio's local art scene. His use of textures, brush techniques, and color blends are an awe of his mind, leaving respected artists and art enthusiasts with an ever-lasting impression of admiration. At the age of 2, Nathaniel's parents noticed delays and sought out assistance. "We noticed Nathan's knack to create," his mother says. Drawings on the wall were recollected by his parents. Constant facts and images using his memory could be recalled as well. By the time Nathan was 10, he had been diagnosed with autism and continued to pursue his talents. On his 12th birthday, Nathaniel requested paints and canvas as a gift. Needless to say, after his first painting his ultimate gift was exposed. Nathaniel now spends hours of his free time researching and learning techniques. His favorite artist is the legendary Bob Ross. Now, Nathaniel continues to paint beautiful landscapes and abstract paintings for the public to enjoy. He loves to see his paintings "make people happy." He loves to share his gift. Painting provides a form of therapy for Nathaniel's own unique story. When asked what inspires his paintings he replied, " I see the mountains in my mind, & I feel like I'm there." ​Never discredit any mind! We are all unique & talented!